It's a grey, damp evening in what should be spring. Meraki's social promises a restaurant 'inspired by the lifestyle of the Aegean Islands'. Yes, thanks. Yes, we'll have some Aegean Island living. Bring us your staggeringly cheap carafes and your bean soups and perfect tomatoes and crusty bread. Meraki isn't that Greek holiday, though. Meraki's not a sun-bleached taverna on that budget Aegean getaway. On price points and intricacy of the food, Meraki's a window into a different sort of Greek holiday. Boutiquey chic rather than taverna chill, Meraki's the small island harbour where everybody arrives by staffed yacht and in mixed-print silks. 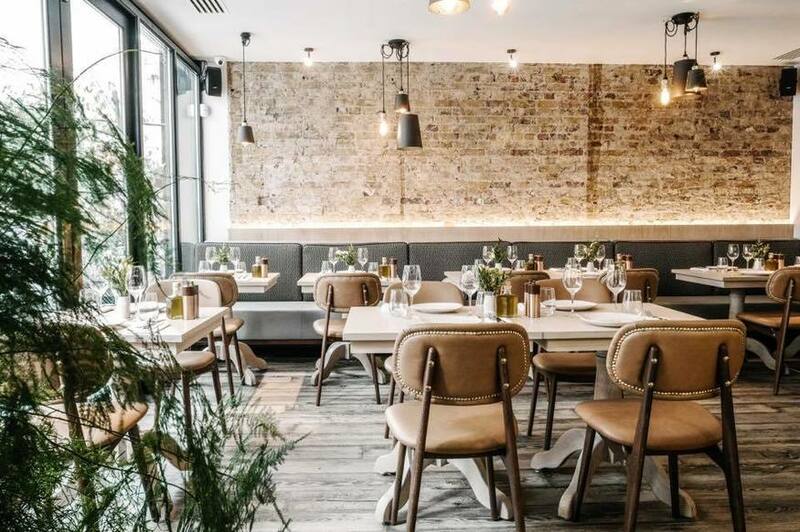 Meraki's dining crowd on a weekday evening are blow-dried and tailored, and happy to drop £16 per small plate of pastitsio-luxe. But formalwear aside, Meraki still comes with some of the informality and friendly clatter of a busy neighbourhood restaurant. Most tables are filled, and a lot of them with groups — loud, celebratory and often Greek, putting away small lamb chops and caviar-topped seafood like there's no tomorrow. The Greek salad's very true to every Mediterranean holiday ever, where you eat something basic, something that you have eaten many times before — maybe a tomato, sliced. A piece of salted bread. Some grapes — and it's a choir-of-angels-singing revelation. This particular revelation's stuffed with fat chunks of herby feta, with croutons that do an initial crunch and then a sort of pleasantly oily dissolve on the tongue, and with Santorini tomatoes that remind you not all tomatoes are created equal. Same goes for the taramosalata, a dip we strenuously avoid in its shiny pink form from UK supermarkets. This one, though — it's a creamy, rich white paste, with more in common with salty, soft cheese than seafood. It will trick you into buying the Sainsbury's version days later, having decided your palate has just grown adult enough to appreciate taramosalata. It hasn't; it's just the Meraki one you're into. Spinach pie salad's a signature dish here, a cold, lasagne-shaped job of feta, dill and filo that's the only underwhelmer of the evening — pretty and intricate, but oddly uncomfortable to eat, the crackling stacks of filo begging for something to lift the dryness. It's a just-okay note among some proper fireworks of sharing plates: their take on pastitsio — the trad version's a slab of baked pasta — is a small group paccheri pasta sheets, blobs of oxtail ragu, graviera cheese and truffle sitting on top like teeny open-faced sandwiches. Looks delicate, but the cheese-truffle-oxtail trifecta's a powerful thud of indulgence — moreish enough to slightly regret the small portion size, rich enough to be slightly relieved about it. And gyros tacos, with stuffings of pork belly, onion and yoghurt, are a bite-size, daintied-up twist on your kebab shop doner. Like Meraki itself, they're an enjoyable, sleeker (and pricier) version of something familiar — done with a wealth of style. Meraki, 80-82 Great Titchfield Street, W1W 7QT.